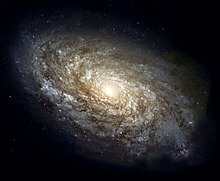 NGC 4414, a typical spiral galaxy in the constellation Coma Berenices, is about 17,000 parsecs in diameter and approximately 20 million parsecs distant. Globular star clusters in the galaxy rim or halo can be seen; also stars of our galaxy can be seen (colour). Tara ke samudar dher tara ke ek jhund hae.